A little over a year ago composer Olivia Block’s Karren was released on Sedimental Records. Published simultaneously with Mike Bullock’s Figures Without Ground, these two recordings would be the last of the label’s CD releases – Sedimental proprietor Rob Forman decided to close shop after 20 years of cataloging, among a number of fine releases, Block’s inaugural work, 1999’s Pure Gaze. Asked once in an interview to choose a release from the Sedimental catalog that he considered “quintessential”, Forman picked Pure Gaze. He has remained a champion of Block’s work, releasing half of the eight titles bearing her name since her 1999 debut. Fittingly, Sedimental’s swan song this year was a DVD of Block’s project with filmmakers Luis Recoder and Sandra Gibson entitled Aberation of Light: Dark Chamber Disclosure. Anyone following Block’s work as long as I have has come to appreciate a striking aspect of her compositional practice: she is continually experimenting with the dualities inherent in her sound materials and structures – dualities of organic/inorganic, of coherency/chaos, of pitched sounds/noise, of inside/outside (in any number of senses), of foreground/background; and, with Karren – an orchestral/concrète work that Block released following six years of her characteristic process of meticulous assemblage and editing – the idea of front and back stages. The nomenclature of stages comes from the astonishing early work of the sociologist Erving Goffman; front and back stage are aspects of the dramaturgy of interpersonal styles the author developed in his first published work in 1959, The Presentation of Self In Everyday Life. Block references Goffman’s theories in the notes she wrote for Karren as follows – Erving Goffman’s dramaturgical metaphor described in The Presentation of Self in Every Day Life is a lens through which the entire composition, presented on vinyl, might be viewed as a metaphor for the self. I haven’t seen a reference to Goffman’s ideas in any other musical project I can recall; I was intrigued to read Block linking the front and back concepts, as Goffman articulated them, to music, as I first encountered his theories nearly 40 years ago while doing my clinical training at a psychiatric facility. I was, for a time, very taken with the work of the British and Scottish psychiatrists David Cooper and R.D. Laing, radical clinicians associated with the so-called anti-psychiatry movement. If you swam in those waters, you’d inevitably encounter the sociologist Erving Goffman, who published a book in 1961 entitled Asylums. Goffman’s work provided us with pith quotes for the zeitgeist, like Society is an asylum run by the inmates. He also developed rich metaphorical language to describe a duality inherent in every social relationship; the imagery of front and back stage refers, broadly, to how we navigate between our socially appropriate persona (front stage), and the self we experience when we set aside social roles and identities (back stage). Goffman used the language of the performative self and the definition of the situation (referring to how we engage in power struggles with others to establish provisional social realities). All is theater, spectacle, and we are endlessly slipping between performance and a highly protected back stage, maintaining the front, shielding the back. Of course these metaphors hardly seem radical at this stage, and given the necessarily reductive presentation of Goffman’s theater of social and interpersonal control and manipulation of borders and boundaries; I simply want to suggest, with these bare bones from Goffman’s work, that Karren can be heard as experimenting with the duality of the front and back stages in ways that, intuitively, we already hear. Block’s approach with Karren is to sound those dualities distinctly, front and back, but also to cause the piece’s initially discrete parts at certain points to intrude, collide, impose, and enmesh with each other. 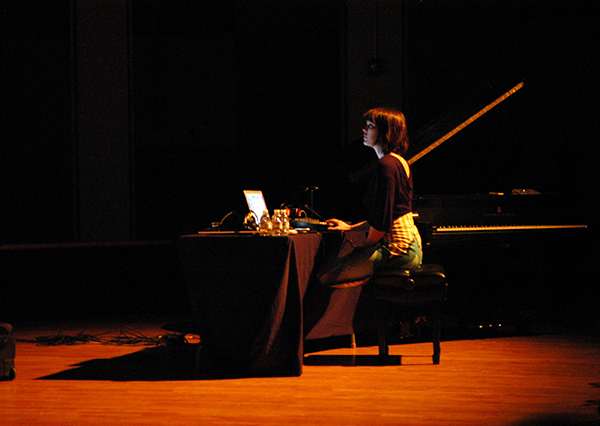 This approach is heard across much of her work over the years, previously woven from electro-acoustic materials and small chamber voicings; on Karren, the composer at last had access to an orchestra (the Chicago Composer’s Orchestra) attuned to moving fluidly between scored pitches and improvised noise, location recordings and massed strings, riding woozily on waves initially serene, but increasingly pitched toward capsizing (in this last regard a little reminiscent of Block’s fantastic Heave To from 2007). Most overtly, Block uses the dual-sided medium of vinyl to present Karren‘s two movements as back stage concrète (Foramen Magnum, the A-side of processed location recordings), and the reasonably conventional front stage orchestral music (Side-B’s Opening Night, a movement that I think subtly slips into its own back stage, as I suggested above). Within each movement, however, you might hear, as I do, the composer as syncretist, bringing the back stage footfalls, chortles, throat-clearing, and tunings into spheres of calm and control; and in the case of Opening Night, the serene, floating world of musicians entrained to an idea of order is gradually subsumed by what sounds like mulched hand-claps, a crunchy sound reminiscent of sections of Pure Gaze and Mobius Fuse. Block is always experimenting with the boundaries of Goffman’s definition of the situation, the situations of front and back, unity and difference, inside and outside – it occurred to me listening repeatedly to Karren that Block has continued exploring, without wavering, the borders and boundaries of sound first heard in Pure Gaze fifteen years ago. Finally, The Unanswered Question – I chose this title at first as I kept thinking of Ive’s piece when listening to Opening Night. I’ve been unable to shake that link – it’s not an overt resemblance to Ive’s masterwork of concision and clarity. It’s particular tensions in the respective pieces, and the elemental tension throughout the pieces, that hook them together for me. Both are sound collages with slow, calm strings, passing tones spiked with moments of agitation, dually owning a sense of harmony and dissonance, independent tempi, a front stage intruded upon by a back stage uninterested in image management. Block’s body of work rides, in part, on the unresolvable quality of unanswered questions; she’s drawn to sounding out these dualities with a range of materials and approaches, fixed, fluid, improvised and composed. Karren is a rigorous work, and owns a momentum that will be self-evident to anyone who listens through the composer’s work from Pure Gaze to the present. It also owns, however, a sense of unquiet and transience; in an interview with Tobias Fischer, who asked her about boundaries between music and non-music, Block said, I try to deal with this question in my work, because I don’t know the answer, but the question is important to me. This entry was posted in music writing on December 22, 2014 by jessewgoin.